Vintage From Paul is pleased to offer these pristine condition Sterling China Colonial Dresden Restaurant Dinner Plates. These Sterling China Colonial Dresden Restaurant Dinner Plates were manufactured from 1930-1950. This mustard-edge-line, ivory-body Dresden pattern by Sterling is similar to the Colonialpattern produced by Syracuse China with multi-colored bouquets of mixed flowers, including tulips, roses and daisies. The bottom of the Sterling China Colonial Dresden Restaurant Dinner Plates show the stamp of the Sterling China Co., E. Liverpool, Ohio. 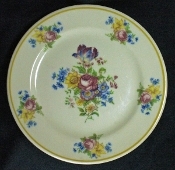 The Sterling China Colonial Dresden Restaurant Dinner Plates measures 9-1/2 inches in diameter. Each available Sterling China Colonial Dresden Restaurant Dinner Plates is in pristine condition showing no signs of previous use.